Above: The Kevyn Aucoin Sensual Skin Fluid Foundation has arrived. A couple of weeks ago, I attended the Neiman Marcus Project Beauty event (discussed HERE). Although I exercised significant restraint in my purchases, I couldn't resist procuring yet another new foundation debut, this time, from the iconic Kevyn Aucoin line. The Sensual Skin Fluid Foundation (available at Neiman Marcus, Space NK, Barney's NY and Cult Beauty) is the first fresh KA base product since the Sensual Skin Balm (reviewed HERE) was released nearly two years ago. With a liquid texture and medium coverage and natural finish, this foundation is fantastic for daily use. Special thanks to Kevyn Aucoin makeup artist Patricia Le for helping me to make the subsequent swatches possible! Above: The Sensual Skin Enhancer Fluid Foundation comes in a frosted glass bottle. Luxurious, ultra-lightweight fluid foundation that provides luminous coverage, "no makeup" feel, glides on to provide smooth, luminous looking skin with buildable coverage. Serum formula features potent anti-aging ingredients including Pigmento Perfetto, a powerful marine-based algae extract known to fight the production of Progerin, a protein that accelerates aging by encouraging loss of firmness and elasticity. Buildable coverage, from light to medium/full. Long wear coverage wears for 6-8 hours. Oil free, water free, powder free paraben free and nano ingredient free. Always start with a freshly moisturized and primed skin. 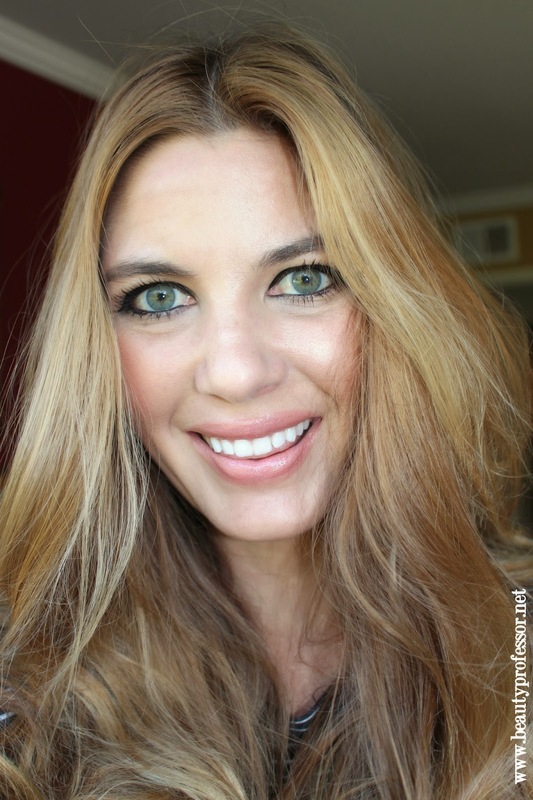 We suggest using Kevyn Aucoin The Primed Skin Developer for a flawless canvas. Start by dropping a small amount of product onto your fingertips or the Kevyn Aucoin The Foundation Brush and apply starting at your nose blending outwards to your hairline. Above: The pump top brings the foundation into the glass wand for easy application. I have tried so many foundations this fall that it is almost overwhelming, even for one who endlessly adores the chance to experience. Consequently, I will do my best to describe the major tenets of this formula as well as what distinguishes it from other foundations I've recently reviewed. This formula is very fluid in texture and one might be tempted to compare it to the Giorgio Armani Maestro foundation (reviewed HERE), however, the packaging (with a decanting wand) and watery texture are where the similarities stop. The Sensual Skin Fluid provides much more coverage than the extremely sheer Maestro and has a more matte finish initially. I find that 5-6 drops are all that is necessary to create a medium coverage effect; after priming, I buff said drops into the skin with a Beauty Blender. The result is wonderful...an even, matte canvas with a natural matte finish that looks better (taking on the slightest glow) over the course of wear. The formula, which is essentially unscented, doesn't irritate my very sensitive skin and I get 6-7 hours of wear before feeling the need to touch up with powder. I haven't used it long enough to be able to speak to any cumulative skincare benefits but am please with how my skin looks and feels over the duration of wear. By and large, this is a grand option for one seeking natural-looking medium coverage with decent lasting power! Above: The glass decanting wand decants the foundation easily and precisly...only a 5-6 drops are necessary for medium coverage. Above: The full ingredients list...relatively short but decidedly 'cone heavy. Above: All eight shades, prior to swatching. 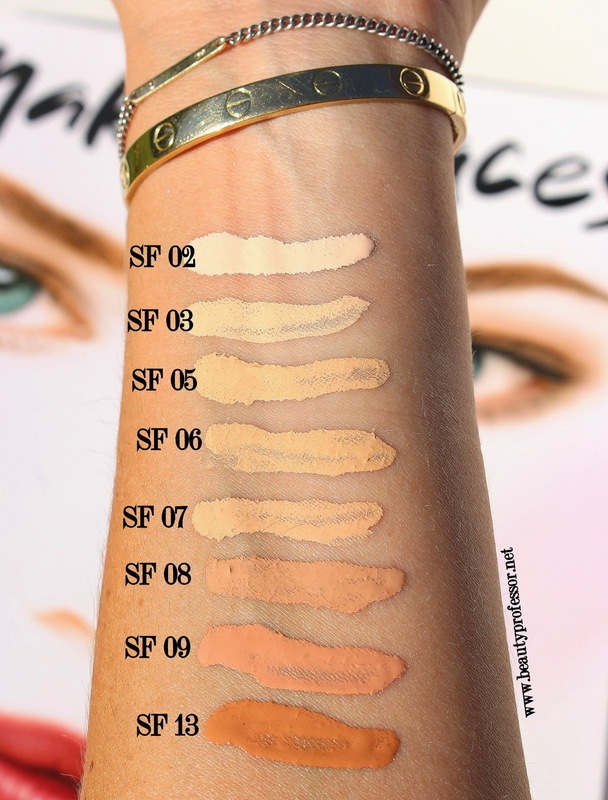 With regards to the eight shades, there are two great options for very fair skin (SF 02 and SF 03), three practically identical options for light-medium skin (SF 05, SF 06 and SF 07), two options for medium-dark skin (SF 08 and SF 09) and one choice for deep skin (SF 13). In light of how inclusive Kevyn Aucoin has been with his original Sensual Skin Enhancer range, I was a touch surprised by the limited nature of both cool and rosy undertones and deep shade options. Above: Swatches of all eight shades in direct sunlight. Above: Swatches of all eight shades with a flash. 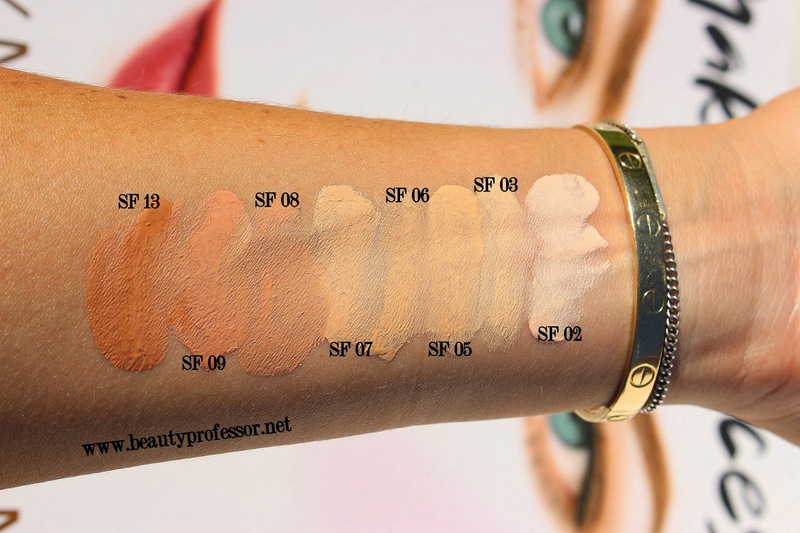 Above: Swatches of all eight shades in the shade. Above: Swatches of all eight shades blended to illustrate depth and texture. Above (L-R): Comparison swatches in direct sunlight...Tom Ford Traceless Perfecting Foundation in #05 Natural, Laura Mercier Smooth Finish Flawless Fluide in Dusk, YSL Fusion Ink in B40 Sand and Kevyn Aucoin Snesual Skin Fluid Foundation in #07. Despite their visual differences in this image, they are all a reasonable match for my current NC 25-27 skin tone. Above: Kevyn Aucoin + Surratt Beauty...a quintessential combination. Since Troy Surratt, creator of Surratt Beauty (swatched HERE and HERE and discussed extensively on my blog) worked closely with Kevyn Aucoin, I thought it would be befitting to create a look that features the Sensual Skin Fluid in conjunction with a host of Troy's beautiful products. Above: Extreme closeup...to illustrate the formula's basic lack of obvious texture. Above: Natural sunlight, no flash...Surratt Beauty Autographique eye liner in action. Above: Indoors with a flash. Above: Indoors with natural sunlight. Bottom Line: The Sensual Skin Fluid Foundation (available at Neiman Marcus, Space NK, Barney's NY and Cult Beauty) is a marvelous addition to the Kevyn Aucoin Beauty line. It fills a void between the ultra-pigmented Sensual Skin Enhancer and the Sensual Skin Balm and is the most reasonable option for those seeking a one-step, medium-coverage foundation with a natural finish from Kevyn Aucoin's current product offerings. I would love to hear your questions, thoughts and experience on this formula...please share in the comments box below! **Some PR samples provided for review (the majority--including this foundation-- bought by me) however, as always, all of my opinions are expressly and unequivocally my own. Okay you need to try the new Sisley phyto foundation. I have never tried this brand and was curious from blog posts...I got two samples and Whoa! It's super pricey but I have to purchase. It's also like the ga maestro but more coverage/ natural looking and it wore like iron! Plus it's supposedly "good" for your skin, which I can't attest to since I only wore it for two days but I was pissed when my samples wore out! Next purchase! You know, maybe the sample of the Sisley I received wasn't the right one because it didn't have a runny texture at all. It was a thin fluid, but certainly nothing similar to the maestro. I've read others say the Phyto is similar to the Maestro, so I think I'm going to have to go back for another sample. Great swatches as usual, thanks! I absolutely love YSL Fusion Ink but no matter what I do I am always so oily after just a few hours. How do you think this foundation would hold up to my combo/oily skin? I think this foundation works well with combination skin but nothing works as well Tom Ford Tracelss Perfecting when it comes to oily skin! I also find that CT B Perfect is somewhat similar to TF Spanish Pink but it doesn't deepen as much as the TF does...I love it! You look beautiful in this post- so if the new KA foundation has anything to do with your subtle glow from within-GREAT! I'm buying a bottle :) surprised with the limited shades tho. Great swatches- Thanks! Thank you so very much...so kind! Yes, the shades are quite limited...strange, no?! Thanks for the review, I can understand that you must be feeling overwhelmed! I am astounded at how bad the shade range is. Also, it's completely pink/orange despite claiming to be for yellow/golden undertones. I am an NC 40-42 (which btw is not rich, dark skin but medium tan LOL) and there is just nothing. In terms of intensity I'd be somewhere between shades 7 and 8, but 7 is too chalky and 8 too salmon pink. Oh well, I have also bought rather a lot of foundations recently :D.
I tried this foundation two weeks ago. Unfortunately I had to take it back--two orange/pink an undertone for my already rosy, yellow face. Also wasn't to happy with the eye-dropper style bottle. Sorry to hear that Sunnykm! So many incredible foundations on the market...hope you are able to find another great option. My pleasure, Bella! I agree...the shade range is utterly strange, especially for a line that has built a legacy out of being inclusive to individuals of all skin tones! What foundations are you loving these days? True, Stellagirl...the closest to light neutral is the #7 and I fear it's a smidge dark for NW20 (but close, nonethelesS). It looks really lovely on your skin. I couldn't find a good match in YSL Fusion Ink (the lightest yellow shade wasn't yellow enough), so I'm hoping shade 03 in this might work. I've tested so many foundations out lately that my skin is starting to rebel. 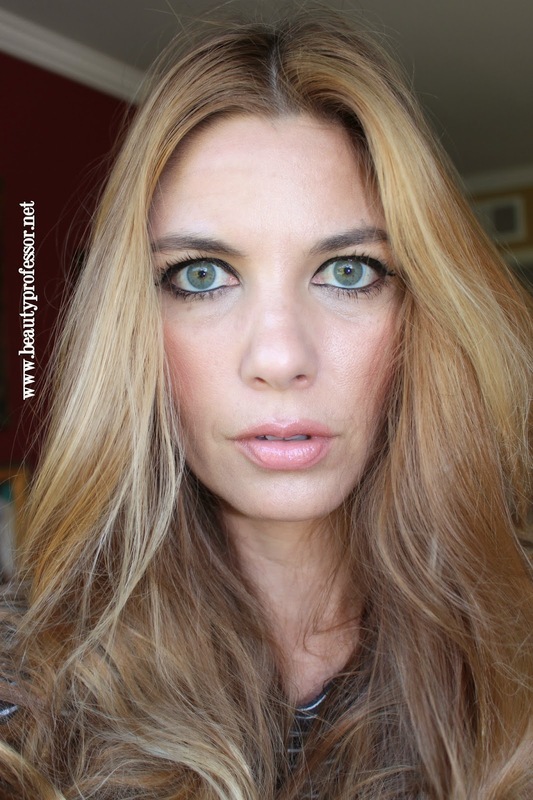 While I wanted to love Tom Ford's, it was too sheer (I have dark acne marks to cover) and dewy for me. Same with Phyto's new one! Dior Star foundation makes my skin glow and looks fantastic immediately upon application, but I have the same problem as you in that it doesn't last a full day. Plus, they don't have a fair yellow shade, so the color's a bit off on me. I think I should try Cle's new one again, but I don't love the price tag. What I'm actually eagerly awaiting is Burberry's Fresh Glow foundation? Have you heard anything about it yet? Thank you very much...I suspect that you may find a match in the #03! I haven't heard anything about the new Burberry formula...will be keeping an eye out for it! Wow!! The number of new foundations this season has been monumental! I can see that this might be overwhelming even to you!!! Well, maybe not! :) This looks gorgeous on you, and the details and swatches are incredible as always. Do you find any pinkness in the #7? It doesn't seem like it, but next to #6 it sort of does on my screen. I apologize for all my questions. I really want to try and stick to one new foundation to get me through fall.....who am I kidding!?!? I want to try though :) I am having a hard time getting to the Tom Ford counter, but I am leaning toward that foundation. I think I prefer a little thicker of textures since I can blend them down to a sheere coverage, rather than adding. I may change my mind on this ten times before I actually choose one.....or three. I don't find any pinkiness in the #7...it is more a neutral to yellow beige! With regards to your question, I think I would indeed bring the TF Traceless Perfecting...truly, it hasn't failed me yet...great coverage, very long lasting and it simply looks fantastic on the skin. Natural 05 is still OK but getting a bit dark for me and I think I'll pick up Bare Beige to mix with it. I found Bare Beige to be a light yellow beige and Bisque is actually quite neutral (not pink, but on its way...). No need to ever apologize for your questions, my friend! I think (hope!) that you will love the TF as I do. xoxo and have a lovely weekend...talk soon! So many foundations! I am all about foundation so I love these reviews. Must get to the counter to try some of your favs in person. So many foundations oxidize on my skin. Yes!! They are never-ending right now. Thank you so much for the very kind words! Your skin ALWAYS manages to look impeccable. I've definitely purchased several foundations this year--the YSL, TF, and CdP. I like my long lasting foundations, but I also like my dewy ones (KS is still my favorite). I've been meaning to try the new Sisley foundation, but I'm a little hesitant. I tried the old formula and it lasted only 4 hours on me, despite claims of being long-lasting. Have you given it a go yet? Wow...what a compliment, MG...thank you! Good foundation and good light, I promise ; ) I have indeed tried the Sisley (swatches of all shades in the next few days!) and I find that it lasts for a long time and looks lovely, however, it could feel a bit heavy on my skin...more testing required! More soon! Another recommendation for Silsey Phyto Teint Expert, it just beats all other foundations. It looks natural, lasts pretty long time, gives you radiance, you should definitely check it ! Good to hear, Ena...thanks for the recommendation! Hi, this is my first time posting a comment. First of all - thank you for being so thorough with your swatches the products you review! They really do help for people who prefer to shop online. I wanted to ask - which one would you recommend between the Kevyn Aucoin Sensual Skin Fluid and the By Terry Densiliss (assuming I will be able to find a shade match - I am shade 3 in By Terry Sheer Expert)? I understand there's a bit of a price difference, but ultimately I would like to get only one and so would like to choose well.. Thank you so much for your kind comment! With regards to your question, it all depends on your texture preference. Both offer lovely medium, semi-matte coverage, but the By Terry is thicker and has skincare benefits while the KA is thinner (more fluid) and has less skincare infused into the formula overall. I love both but have been wearing my Densiliss more as the cooler months approach. Thank you for your advice, Beauty Professor! I was leaning towards Densiliss and actually have a sample of it but was on the fence because of the price: I'd want to be really sure! This is the final nudge I needed. ;) Thanks again for the response, and for your wonderful blog! I am so glad my thoughts could help to clarify your decision...please keep me posted on your experience and I hope you LOVE your new foundation!